Oral presentation by Michele Staiano (University of Naples Federico II) at the 10th International Multi-Conference on Complexity, Informatics and Cybernetics (IMCIC 2019), 12-15 March 2019, Orlando, Florida, USA. Presented in the Special Invited Session on Research and Design on 15 March 2019 (see program and abstract here) and awarded by the conference organizers. 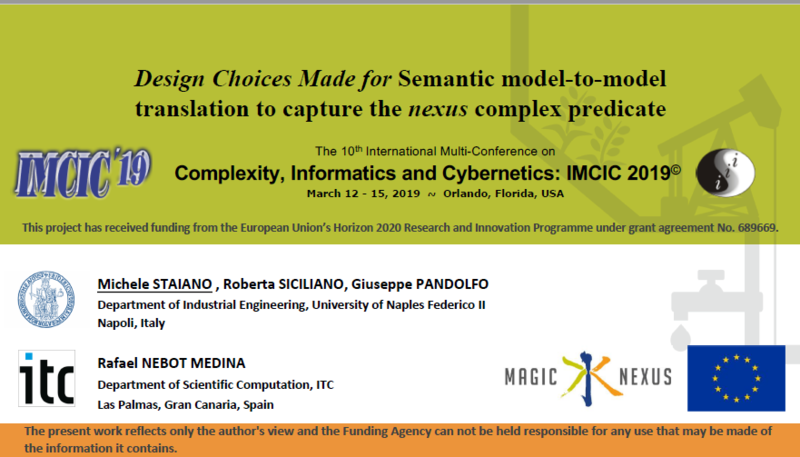 Quote as: Staiano M, Siciliano R, Pandolfo G, and Nebot Medina R (2019), Semantic Model-to-Model Translation to Capture the Nexus Complex Predicate, presentation at the 10th International Multi-Conference on Complexity, Informatics and Cybernetics (IMCIC 2019), 15 March 2019, Orlando (FL), USA. IMCIC2019 Presentation Semantic model-to-model translation ..